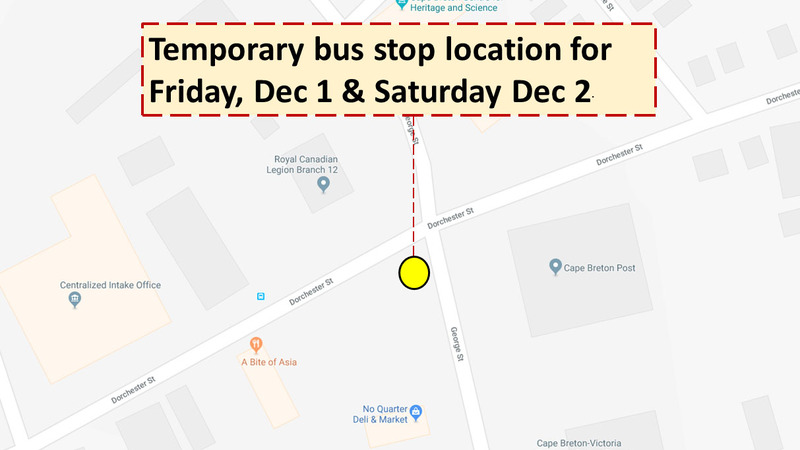 This Friday and Saturday, December 1st and 2nd, CBRM Transit has four bus stops in downtown Sydney that will be temporarily relocated to the corner of Dorchester and George Street due to a road closure. Rerouting to the temporary Dorchester/George Street stop (across from Cape Breton Post building) will begin Friday, December 1 at 7:00 am, and continue until Saturday, December 2 at 5:00 pm. Signage will be in place at all rerouted bus stops. CBRM Transit apologizes for any inconvenience this may cause.